AzPA is hosting its 2nd Fun Run of 2015. Join your colleagues and friends for a 5K run — or walk — outside the beautiful Westin La Paloma Resort Sunday morning June 28. 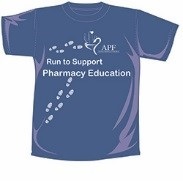 Proceeds benefit the Arizona Pharmacy Foundation — our 501(c) 3 nonprofit that provides funds, materials and resources to the pharmacy profession and the public in order to further pharmacy patient-centered care. Online registration closes Sunday June 21 at 9 p.m. Register today for our Annual Convention June 26-28. This event will host up to 16 hours of CPEs, with session topics that include: Pharmacist's Role in Care Transitions, Grassroots Involvement in the Policymaking Process, Advances in Pharmacotherapy, Management of Anticoagulation, Traumatic Brain Injury, Pharmacy Law, to name just a few. Full schedule attached. You will also have the opportunity to network and win prizes during the Exhibit Hall Reception (Friday, June 26) and Exhibit Hall Luncheon (Saturday, June 27). New this year! With the help of our exhibitors, we have compiled a list of pharmacy-related job openings, internships and residency programs. These opportunities will be on display at the Annual Convention Exhibit Hall Friday June 26th at 5:30-7 p.m. and Saturday June 27 at 12-2 p.m. at the Westin La Paloma Resort Visit booth 51-52 to explore these positions. The company's representatives will be available inside the exhibit hall as well to discuss further details. How do generic drug appearances affect patient adherence?